Guru Chökyi Wangchuk (Tib. གུ་རུ་ཆོས་ཀྱི་དབང་ཕྱུག་, Wyl. 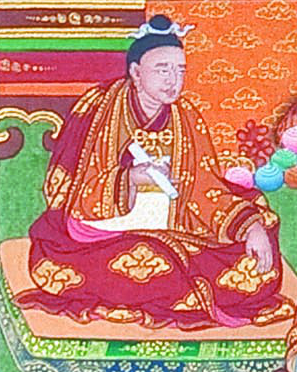 gu ru chos kyi dbang phyug) aka Guru Chöwang (1212-1270) — the second of five sovereign terma revealers and a speech emanation of King Trisong Detsen. Among his revelations is the practice of Lama Sangdü. Dudjom Rinpoche, The Nyingma School of Tibetan Buddhism, Its Fundamentals and History, trans. and ed. Gyurme Dorje (Boston: Wisdom, 1991), pages 760-770. This page was last edited on 4 February 2017, at 01:00.